At church on Sunday, two people, yes, two people ask me if I shaved Baby O's head....hum....NO! Really, what were they thinking, what new mom would shave their baby's head? 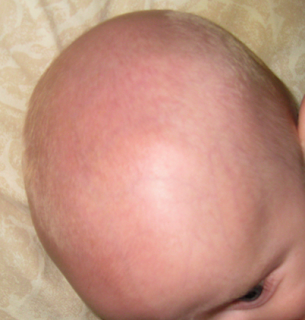 That brings me to bald baby heads (of course, attached to a cute baby body), they are my favorite. I honestly, think that bald babies are so cute, they have this old man look. Baby O is over 4 months old and doesn't really have any hair except this long patch (that is very blond, although it might have a hint of red) that is growing out of the scar he got from the monitor attached to his head during his birth. And I save money on baby shampoo. Actually, we have shaved our babies' heads. It was only after they had lost all their hair and had that little bit in the back that looks like a mullet. Also, we shaved Rachel's because she was bald on top, not on the sides and had these little pieces on top that looked like a comb over. It really needed it! you're at least lucky he's a boy. Everyone asked me what "his" name was with my daughter (dressed in pink). awesome. we just got our first haircut last week at 26 months. She still looks lke a boy. how sad. grow hair.... grow! and no, she is not getting her ears pierced till she's 10 and she can take care of them herself.